Oh, the irony of working on this post today. I spent last weekend in Bristow, Oklahoma celebrating my Aunt Lois' 80th birthday. My Uncle Jack prepared a mountain of smoked meat for the occasion and I'm pretty sure I ate my weight in smoked bologna. Bologna is pretty much the antithesis of how I normally eat, but it reminds me of childhood and college, when a big hunk of bologna wrapped in red plastic from the Food Lion in Five Points was a major source of protein. When you pair the bologna with my Aunt Lissa's hot mustard and some Bud Light Lime; well, I simply make a pig of myself. Last Spring, ASHA staff and our friends and family took part in a 30 Day Mediterranean Lifestyle Challenge. Throughout the challenge we focused on eating whole, unprocessed food and Kellie shared her experience with October Unprocessed in her Unprocessed Schunprocessed post. 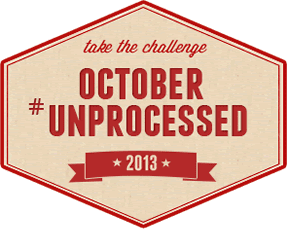 I was intrigued and made the commitment to participate in October Unprocessed this year. (I'm looking forward to it as a bologna detox of sorts at this point.) If you've wondered away from the healthy Mediterranean habits you adopted last spring, you can use October to re-examine your choices and get back on course. Kellie and I hope you and your families will join us in our October challenge. Getting started is simple, read Kellie's post and then go to the Eating Rules website and take the October Unprocessed pledge. You can even enter to win a gift pack of food from Bob's Red Mill and print off some coupons. My birthday is in October and I used to brag gleefully that I would always spend my birthday getting jacked up on Halloween candy that I bought way too early to be practical. To me October was a free pass to eat birthday cake and anything that was “fun sized.” Well it was all very fun until November would roll around and I felt exhausted, sluggish, and was faced with the looming holidays, complete with non-stop cooking and eating. So if I needed butter, I bought it. I would not buy, however, a “soft butter-tasting spread” that has a bazillion ingredients in it, because there’s no way I could have reasonably made that in my kitchen. Same with pasta, beans, produce, cheese, yogurt, etc. The idea is, if you could make it (within reason) you can buy it. I still can’t make an Oreo or Nutella, so those are off the list. Here’s where sanity comes in. So what if during the month you slip up and have some candy corn or a Pepsi? Really, what happens? Nothing. No biggie. What if you’re out at a restaurant and you can’t be sure that they are using whole ingredients in the kitchen? Again, nothing, please just enjoy your meal. The point is that you can do your best and not sweat the 20 percent of the time that it’s unavoidable. If you keep up the 80 percent portion, by the end of the month you should still feel a difference anyway, so why beat yourself up? I survived my first foray into this challenge. Last year I made a lot of soup, uber-healthy muffins and breads, a few awesome casseroles, and let’s not forget smoothies. I even figured out how to make unprocessed brownies using coconut sugar and maple syrup. My family ate some of it with me (my husband more than my kids) and here’s what happened: I stopped craving sugar. When my birthday came around, I didn’t even really want my cake that I had decided would be an allowable cheat. I did eat some Halloween candy toward the end of the month, but not much. Bottom line, I had more energy and felt great going into the holidays. Oh, you want to know what happened to my husband who did this mostly by default? He lost five pounds. Seriously. We kept some of the eating habits throughout this year and now are going to do it again (now with more enthusiasm from my husband, I might add). I’m already cooking for it – making soups and freezing casseroles and looking up recipes. If you want to join me go to the Eating Rules website and take the pledge. I’ll share some of the recipes I’m trying and hoping you will share, too! What do you have to lose? You can do anything for a month, right?